An Orange march which was to pass a church where a Catholic priest was spat on has been rerouted after police warned of potential for significant disorder. Bradley Wallace was jailed for 10 months in February after admitting assaulting the priest – a charge aggravated by religious prejudice. 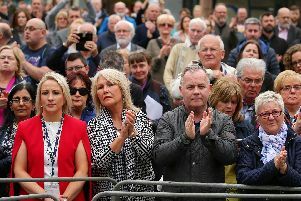 Glasgow City Council rerouted the procession, which will go from Tullis Street to Cathedral Square and back, away from the church, following a meeting on Tuesday. The Archdiocese of Glasgow tweeted: “We welcome the decision of @GlasgowCC to reroute the march planned for Easter Sunday morning past St Alphonsus and St Mary’s.